Disney returned to the classic animated movie well with their latest big budget family film, Dumbo. The studio seems stuck in this cycle of revamping their popular animated films into live-action productions, and with Dumbo they’ve done so with mixed results. When the titular character is front and center in scenes, Dumbo soars with emotion and beauty. But take away the CGI baby elephant and his adorable oversized-ears and soulful eyes and you’re left with human characters who can’t hold a torch to their animated co-star. Dumbo focuses on the employees of the Medici Brothers Circus, a run-down operation run by ringmaster Max Medici (Danny DeVito). His troupe’s fallen on hard times and he’s looking for new stars to draw in crowds. The horses have been sold off and when war hero/horse trainer Holt Farrier (Colin Farrell) returns from fighting in World War I minus an arm, the only available job is handling the elephants. Seems Max Medici made a deal for a pregnant elephant, pinning his hopes on a baby blooming into a box office bonanza. Unfortunately, when the baby arrives, he’s considered a freak. His gigantic ears hinder his ability to walk and even to see as they flap in front of his eyes. His fiercely protective mom becomes enraged at her baby’s treatment and is forced to pay for exhibiting maternal instincts toward her newborn by being returned to the man who sold her to Max. Separated from his mom just days after his birth, baby Dumbo becomes depressed. Only the presence of Holt’s two children – Milly (Nico Parker) and Joe (Finley Hobbins) who are also dealing with the loss of their mother – gives the little wrinkly-skinned pachyderm any comfort. Of course the adults, including Holt, refuse to pay any attention to the kids when they discover Dumbo can fly. Their eyes are only opened when a freak accident in front of an audience under the big top reveals to all that Dumbo’s huge ears have an incredible purpose: they give the little creature the ability to soar. And soar he does! Dumbo becomes a star and attracts the attention of a multi-millionaire entrepreneur (played by Michael Keaton) who strikes a deal to absorb the Medici Brothers Circus into his own large amusement park enterprise. However, Dumbo doesn’t want to be a circus star. All he wants is to be reunited with his loving mother. There are generations of Dumbo fans who only need to hear “Baby Mine” to tear up, and 2019’s version pulls on those same heart-strings. No matter your age, you’ll feel like a vulnerable child listening to that moving number in the live-action version. Director Tim Burton wisely lingers on the connection and ultimate separation of Dumbo and his mom, establishing the bond through mom and baby holding trunks and by Dumbo’s mournful cries as his mother’s taken away. Whenever scenes shift away from Dumbo to the collection of human circus employees, the film loses its focus. Colin Farrell, Danny DeVito, and Michael Keaton are obviously talented, but it’s the tiny elephant with those floppy ears that drives the story. (DeVito, Keaton, and Burton previously worked together on 1992’s Batman Returns.) Only Eva Green is able to share the spotlight with the CGI star and shine in her own right. The timing of the release of a film featuring a massive conglomerate swallowing up a smaller competitor isn’t perfect, given Disney’s absorption of Fox and the subsequent layoff of Fox employees. Adults who keep up on business matters might be jarred out of the Dumbo fantasy world on a few occasions as filmmaker Tim Burton takes a few obvious jabs at the corporate hand that feeds him. Fortunately, the subversive swipes aren’t so intrusive that they spoil the simple joy of watching a baby elephant fly. 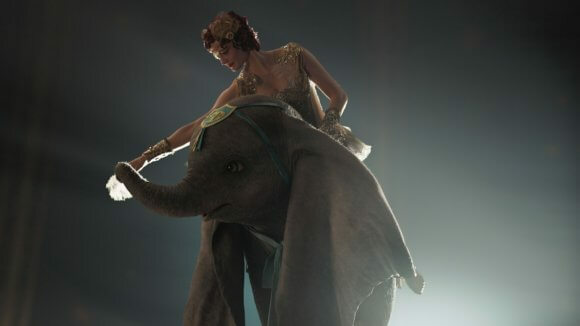 Dumbo is visually impressive and as you’d expect from a Tim Burton production, the sets are absolutely stunning. It’s easy to become absorbed in the world on screen and to feel you’re seated in the circus tent watching the miracle of a baby elephant soaring inches from the top of the tent. The CGI is flawless and little Dumbo as the central character is impossible not to love. The script lets down his human co-stars and is shockingly dark in places which might catch some parents by surprise. Much more a drama than a comedy, the film wastes opportunities to lighten the tone and serve up more humorous moments of Dumbo learning to hone his flying skills. However, it does score points with animal-lovers by stressing the harm of keeping wild animals captive for entertainment purposes. Disney’s 2015 Cinderella, 2016 The Jungle Book, and 2017 Beauty and the Beast proved it’s possible to pay homage to the original animated films while delivering an entertaining movie worthy of their inspirations. But 2010’s Alice in Wonderland (directed by Burton), its disastrous 2016 sequel, and to a lessor extinct 2014’s Maleficent confirmed imitation isn’t the sincerest form of flattery. Still in the works for later this year are the live-action Aladdin starring Will Smith as an occasionally blue Genie and a new version of The Lion King. 2019’s The Lion King has sparked heated debate about what exactly qualifies a film to be labeled “live-action” since there aren’t any actual actors on screen. Cartoon Brew makes the valid point that “photoreal animation is still animation,” even while Disney insists on calling the upcoming theatrical release a live-action movie. Ranking Dumbo on the “Disney cartoons transformed into live-action films” scale, I’d put it below the three best but far above the Alice in Wonderland films. There are moments that spark joy and wonderment, but there are also large chunks of time when the film’s main draw is relegated to a supporting role. No one should ever put baby Dumbo in a corner, especially not in his own film.